This month’s challenge for Amy Warden’s monthly Soap Challenge Club over at Great Cakes Soapworks is to create a soap using the ‘Clyde Slide’ technique. The Clyde Slide is named after Clyde of Vibrant Soaps, who uses this technique to create beautiful (and exquisitely coloured) soaps – do check out his videos on YouTube if you get the opportunity. 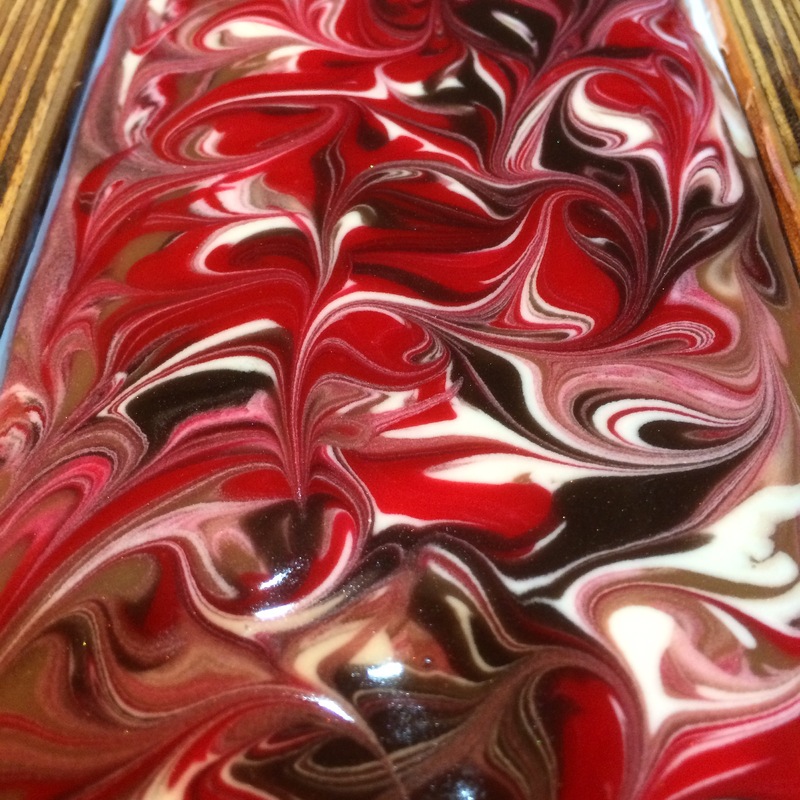 As I’ve just started production of this year’s Christmas soaps, I decided to design my challenge soap around a fragrance oil called ‘Yule Log’. It’s a chocolately, almondy, cakey fragrance, with notes of cinnamon, ginger, vanilla and musk and is delicious out of the bottle. How does it smell in soap? I’d love to tell you but, um, well, I forgot to add it. Oh well, sensitive noses deserve pretty soap too don’t they? 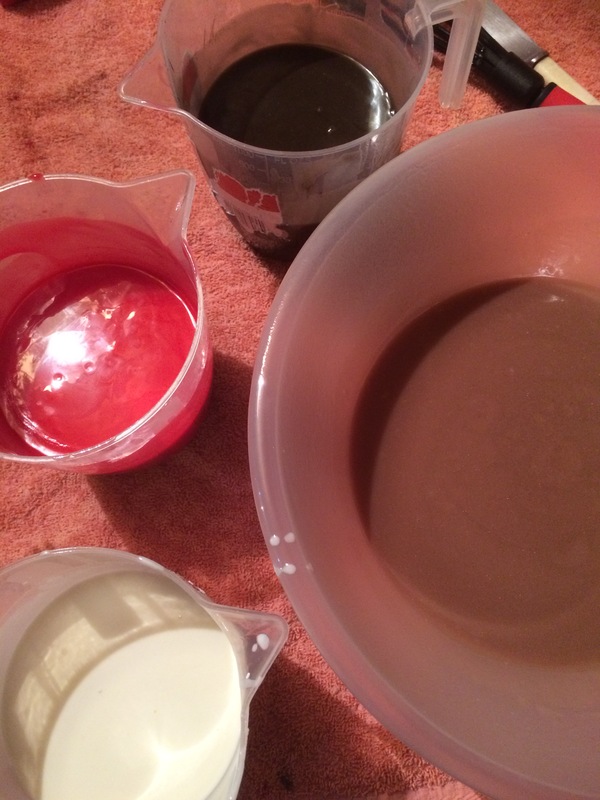 I used a light brown mica as the base colour, to represent the sponge, and dark brown mica, titanium dioxide (white) and red liquid colourant for the cream, chocolate and holly berries elements. I did consider using a little green too for the holly leaves, but in the end I’m glad I didn’t. Usually, when I use the ‘In the Pot’ technique, I would now give the pot a quick stir, just once or twice, but I always stir before pouring. For a Clyde Slide, you DO NOT stir. I can’t tell you how much I wanted to stir!! Many thanks to Amy for her major feat of organisation (apparently there are over 180 entrants this month! ), I’m really looking forward to seeing all the other entries. Good luck if you’ve entered! 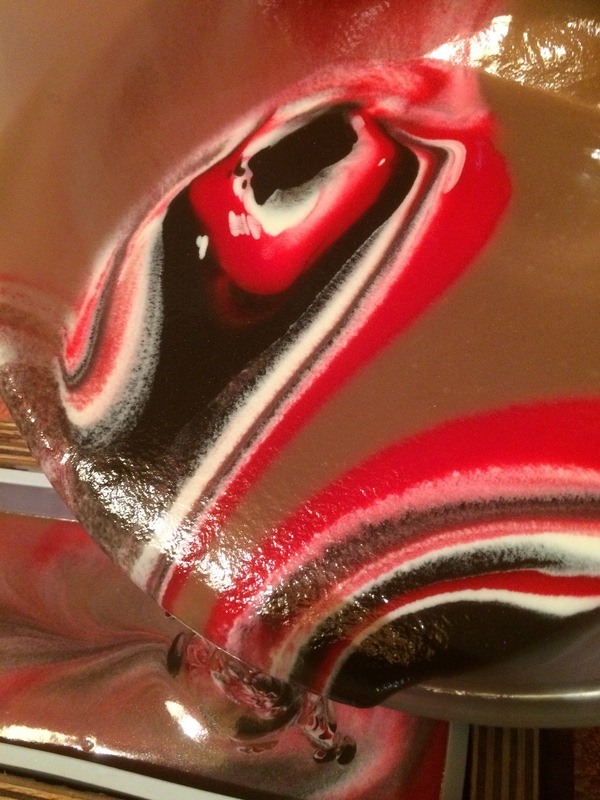 This entry was posted in Competitions, Designs, Holiday soaps, Soapmaking and tagged Christmas, Clyde Slide, Cold Process, Competition, CP Soap, fragrance oil, In the pot swirl, mica, Soap, soap challenge, Soap Challenge Club, Spinning Swirl, Titanium Dioxide by Vicki. Bookmark the permalink. I just got mine out of the mold and (hopefully) will get some time to cut it tomorrow. I think I know how you feel about stirring the soap in the pot 🙂 This time, however, your not doing so paid off! Really a gorgeous soap!! 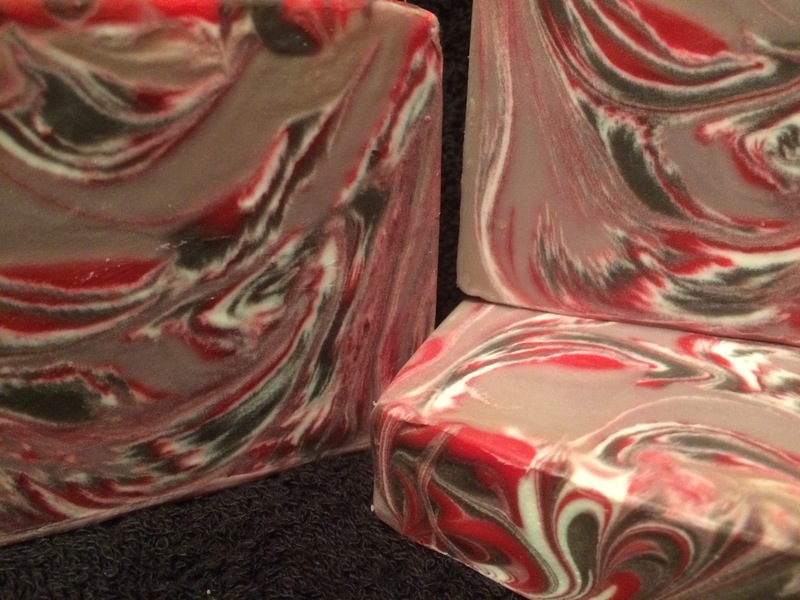 Very pretty Vicki – This reminds me of Peppermint Saltwater Taffy – Yum! It is a shame your forgot this lovely fragrance. Though it would probably have discoloured your red and white. Maybe it was a good for a bad! Your feathery effect is simply perfect! Thanks for the kind comments 🙂 I was only planning on putting the fragrance in the two brown portions – that’s how I forgot to be honest – normally would fragrance the oils before adding the lye but so was out of my usual routine!! 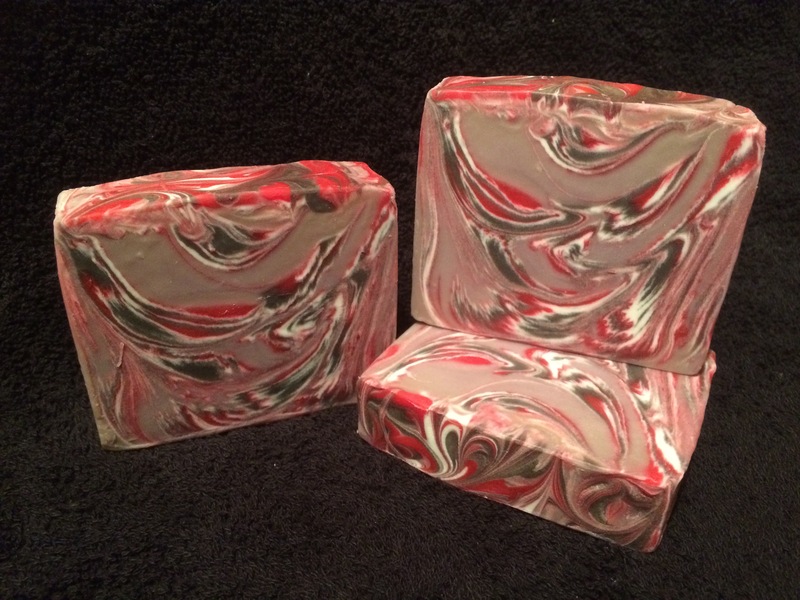 Beautiful unscented soap! 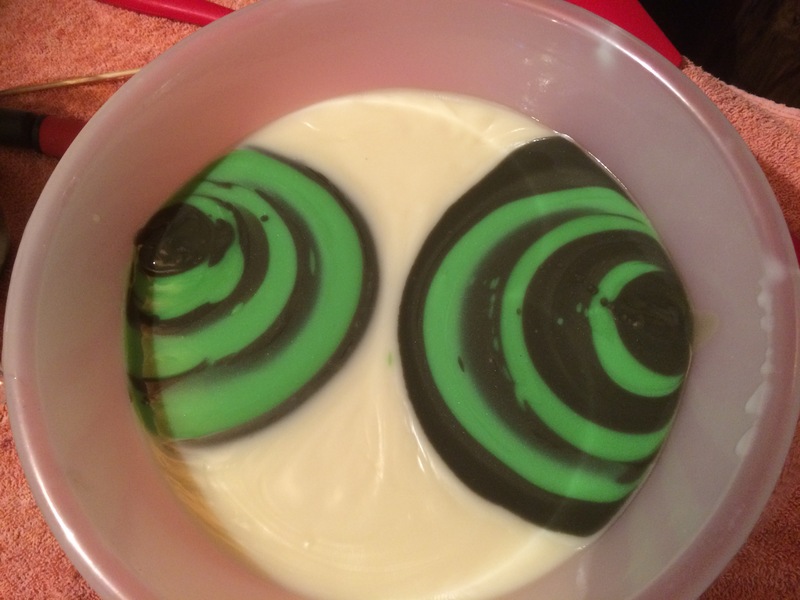 Like how you poured funnel into both sides of your bowl..
On my second try, I forgot to add the fragrance, too! I realized just after I had poured… and decided to forgo what looked to be a perfect pour to quickly add the FO… so I had to stir it all up! Your swirls are gorgeous! So feathery! This is lovely! I love how your colors work together. truly beautiful! I’ll have to try it! I finally gave it a go and now I am obsessed! Every batch I have done lately has been a clyde slide! I love it! Thanks for inspiring me!